Design Therapy: On The Lamb! Warning: An ingenious designer has escaped the realm of typical design causing mass euphoria within the design community. Max Lamb is at the center of a new exhibition presented by Johnson Trading Gallery and last night I had the pleasure of attending a preview party showcasing this British designer's latest collection. 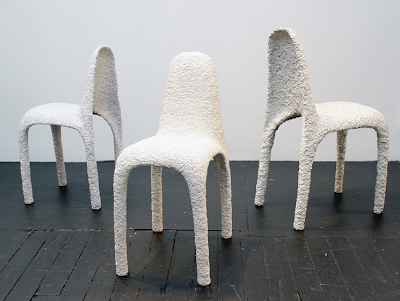 Lamb notes “My recent work has been very preoccupied with processes and materials, and alternative ways in which these can be manipulated.” The chairs above, for instance, are initially hand-sculpted in polystyrene foam and then buried in sand. Lamb then takes 'red hot' molten metal and pours it through a sprue in the sand which melts the foam and fills the existing hidden cavity with bronze. After two hours of waiting, the solid bronze replica of the foam chair is then broken free from the sand. Since the foam itself is destroyed in the casting, a new chair form has to be hand-sculpted each time assuring that no two chairs will ever be alike. For an arresting look at a similar process click here and see why serious collectors are on a massive manhunt for Lamb's incredible work.